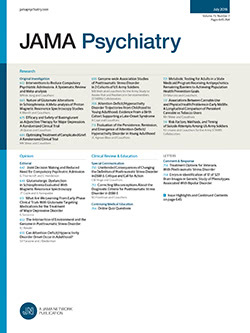 In the article titled “Telemedicine-Based Collaborative Care for Posttraumatic Stress Disorder: A Randomized Clinical Trial,” published online November 19, 2014, and also in the January 2015 print issue of JAMA Psychiatry (doi:10.1001/jamapsychiatry.2014.1575), an incorrect value appeared in Table 2. The mean (SD) distance to the closest Department of Veterans Affairs Medical Center for the TOP (Telemedicine Outreach for Posttraumatic Stress Disorder) patient group should have been given as 91.0 (40.8) km. This article was corrected online and in print.